Often, I come across people that are looking for ways to promote their Ebay store. Many are even looking to promote their Amazon store and stores listed on other online marketplaces. While I respect this effort, I often wonder what is keeping them from opening their own online store? Especially since they seem so interested in online marketing. Paying the marketplace commission and doing their job? Opening an online store is quick and easy, it’s the marketing that takes time and effort. When selling on a site like Ebay or Amazon — which charges commission on each item sold — why put in the effort? It’s like doing the job of an affiliate for free. For those that are not familiar with what an affiliate is, affiliates are people that get paid for making sales, and in some cases driving traffic to a website. FYI, if you are interested in doing this, you may want to look into Ebay’s affiliate program as well as Amazon’s affiliate program (note that Amazon even allows you to integrate their affiliate program with Checkout by Amazon). In fairness for those that are selling on an online marketplace that is free (one like eCRATER), I can understand why a person would want to learn how to market this type of store — after all, it’s free. However, I still believe that it makes more sense to promote a store that is truly yours. A store that is hosted on your own website, that you name, you design and you control. Why? Because this is the only way that you can truly build a brand name and presence online. Does it make sense promoting a website that isn’t your own? After all, what good is it to promote a store on Facebook, Twitter, Pinterest, Google+ etc., if your customer ends up only remembering the name of the marketplace on which your store is hosted? Also, many marketplaces cross-promote the items of other merchants along side of your items. In many cases, they even compare prices. Therefore, if your competitor is offering the same item at a lower price, they may end up making what was supposed to be your sale (thanks to your hard work). 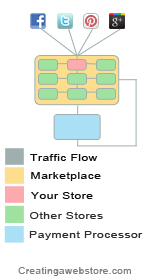 Attached is an infographic illustrating how this traffic flows through the marketplace, to your store, as well as the other stores surrounding it. Then, If purchases are made, the traffic continues to flow through to the payment processor’s website and then back to the marketplace. This is pretty much how I see sending traffic to a store that is hosted within a marketplace — with all the obstacles along the way, you just never know where that traffic will end up, and you may be doing all the work for nothing. Next infographic shows how the same traffic would flow through an independent store (one that is hosted on its own website). As you can see, the traffic now flows directly to the store. 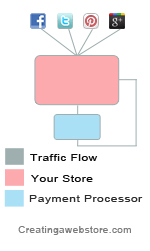 If purchases are made, the traffic continues to flow through to the payment processor’s website and then back to the store. Now, you can also see how we have much more control over things. Retain visitors a lot easier. The above are just a couple of reasons why it’s worth having your very own store. While marketplaces are a great way to make easy sales, hard work should be focused on a store that we have more control over. For information on opening your own store, please see: choosing the best online store software.